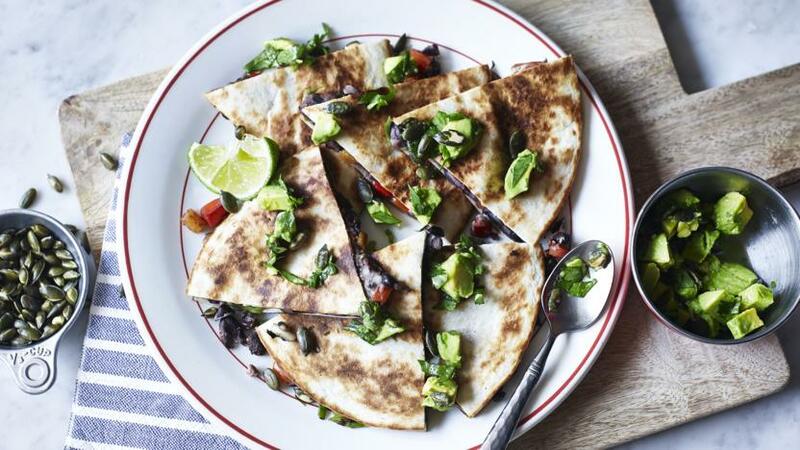 Quesadillas are just fancy for flattened, fried wraps - black beans and cheese fill these with an avocado side salad. In a bowl, mix together the black beans, cumin, oregano, dried chilli flakes, sliced spring onions, chopped pepper and grated cheese until well combined, using your hands to squash the beans. Season, to taste, with salt and freshly ground black pepper. Lay the tortillas out on a clean work surface. Rub the cut sides of the garlic clove vigorously all over the tortillas. Divide the bean mixture between two of the tortillas, spreading the mixture out using a spoon to completely cover the tortillas. Place the remaining two tortillas on top of the mixture, making sure the sides you rubbed with garlic are facing inwards. Gently press down to form two sandwiches. Heat a little of the oil in a large frying pan over a medium heat. Add one of the quesadillas to the pan and fry for 3-4 minutes on each side, pressing the quesadillas down from time to time using a spatula, until the tortillas are crisp and golden-brown on both sides and the filling has melted. Remove from the pan carefully and set aside to drain on kitchen paper. Keep warm. Repeat the process with the remaining oil and tortillas. Meanwhile, in a small bowl, mix together the coriander, avocado, lime juice and a pinch of salt until well combined. Set aside. When the quesadillas are cooked, add the pumpkin seeds to the pan they were cooked in. Fry for 1-2 minutes, or until golden-brown, then add them to the coriander and avocado mixture. To serve, slice each quesadilla into six pieces and divide the slices between two serving plates. Scatter over the remaining coriander leaves, chopped avocado and roasted pumpkin seeds. Garnish the plate with the lime wedges.